A few years ago one of our most popular products was a fabric interfacing called Timtex. Timtex went out of production but has now been re-released by C&T. The formula has been improved and you can once again by Timtex by the metre. 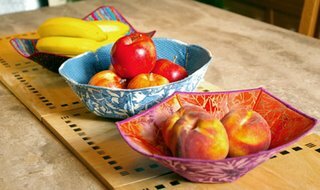 The photograph above shows a number of fabric bowls made with Timtex interfacing and based on the designs in Fast, Fun and Easy Fabric Bowls. Flag Day Farm is the latest Pre-cut pack from Moda. The fabrics are available as a Layer Cake, Charm Pack or Jelly Roll. Below are illustrations of some of the fabrics in the range so that you can get a better flavour. We have just taken delivery of the four Hoffman Challenge fabrics for 2009. The range of is called Willow and the theme of the Challenge is "Enchanted". The Hoffman Challenge is sponsored by Stof. We have also made a pdf of the Rules of Entry and the Entry Form which can be sent to Grosvenor Exhibitions who are running the competition. The closing date for the entry forms is 9th September 2009. 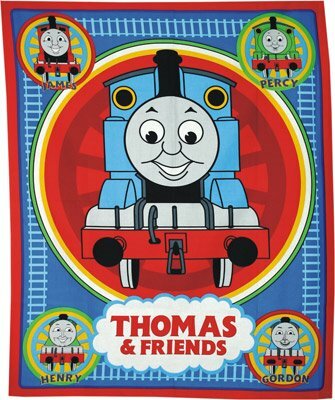 We have a new range of Nursery fabrics that we are sure will prove very popular. 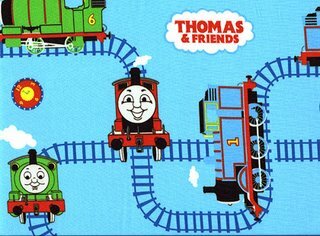 There are two panels as well as coordinating fabrics featuring a range of Thomas and Friends fabric designs. The main panel features a large central image of Thomas. Great for making playmats.